Principles of Microeconomics is an adaptation of the text, Microeconomics: Markets, Methods, and Models by D. Curtis and I. Irvine (and edited by Lyryx Learning), which provides concise yet complete coverage of introductory microeconomic theory, application and policy in a Canadian and global environment. This adaptation employs methods that use equations sparingly and do not utilize calculus. 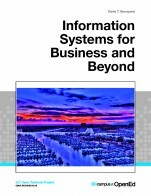 The key issues in most chapters are analyzed by introducing a numerical example or case study at the outset. Students are introduced immediately to the practice of taking a data set, examining it numerically, plotting it, and again analyzing the material in that form. The end-of-chapter problems involve numerical and graphical analysis, and a small number of problems in each chapter involve solving simple linear equations (intersecting straight lines). However, a sufficient number of questions is provided for the student to test understanding of the material without working through that subset of questions. 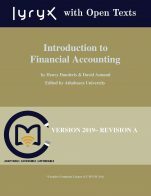 This text is intended for a one-semester course, and can be used in a two-semester sequence with the companion text, Principles of Macroeconomics. The three introductory chapters are common to both books. 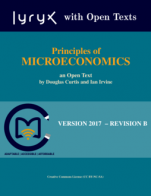 Principles of Microeconomics (Lyryx) by Douglas Curtis, Ian Irvine, Lyryx Learning Team is licensed under a Creative Commons Attribution-NonCommercial-ShareAlike 4.0 International License, except where otherwise noted. Generally, the text’s coverage is comprehensive and for the most part appropriate. I . In Chapter 3, the text should mention population size as a non-price influence on demand and does not consider weather, number of sellers, expectations, taxes, subsidies, the price of substitutes in production and the price of complements in production as non-price influences on supply. Also, while the text considers competing products of other companies as a non-price influence on the supply of a company, this treatment is more about oligopolistic behaviour and should not be examined in the context of the demand and supply model. In Chapter 3, the text examines market demand (as distinct from individual demand) but not market supply. It would be worthwhile to mention market supply and include it as a key term in Chapter 3 even though the derivation of market supply from individual supply is covered in Chapter 9. The text examines price controls and output quotas before elasticity and hints at the role that elasticity can play when governments intervene in markets. However, it may be worthwhile to move Section 3.7 to the end of Chapter 4 so that the role of elasticity on these forms of government intervention could be more fully developed. Students should understand how the price elasticity of demand and its relationship to total expenditure are relevant to output quotas. In Chapter 4, the term, perfectly elastic, is applied to supply but not to demand and the term, perfectly inelastic, is not used at all. These are commonly used terms in microeconomics that should be highlighted as key terms. 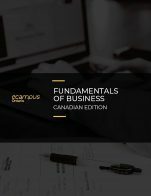 In Chapter 5, the text should develop formal and consistent terminology for the maximum value that buyers are willing to pay (e.g. marginal demand value) and the minimum value that sellers are willing to accept (e.g. marginal supply value) and include these terms in the list of key terms and in the glossary as they are key concepts that need to be highlighted. Section 5.7 is extensive and many instructors might choose not to include it in their courses. Placing this section in Chapter 14 after Section 14.1 or Section 14.4, would make it easier to exclude this section in printed copies of the text. In Section 7.2, the text should specify the amount of economic profit of Felicity's business. The following terms are missing from the glossary: absolute advantage, ad valorem tax, specific tax, total expenditure, total revenue, and unit elastic. I have identified the following errors. Error on page 45: The text states “quantity demanded defines the amount purchased at a particular price”. However, this is not accurate when a market faces a shortage. The amount purchased is the quantity supplied (i.e. the short side of the market). Error on page 47: It is in Chapter 5 (not Chapter 6) that the cases where costs additional to those incurred by producers are examined. Error on pages 157 & 163: According to the text in Chapter 7, implicit costs “represent the opportunity cost of resources used in production”. This definition is not correct when applied to the case of a business owner, who underpays himself. The implicit cost is only the difference between the salary in the job that the owner is foregoing and the salary he pays himself as operator of his business (which is an explicit cost of the business). Error on page 222: The text refers to supply of the monopoly in Section 10.2 in both a sentence and in the sub-heading, Supply and Demand. This is inappropriate because monopolies do not have supply curves. Therefore, the term supply should be removed from this chapter. I feel that Figure 8.5 on page 180 could be better drawn as the ATC1 and ATC4 curves appear to curl back on themselves. I also feel that Figure 9.8 on page 208 should be split into two figures, one showing an increase in demand and the subsequent impact on supply and one showing a decrease in and the subsequent impact on supply. With the exception of a few sentences that make references to dates (e.g. in Section 5.7 and 15.2), few updates will be necessary. 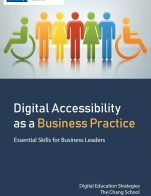 The text is clearly written in accessible prose. There are a few instances where improvements can be made. Two of the biggest challenges for students in microeconomics is understanding how demand differs from quantity demanded and how supply differs from quantity supplied. Clarity would be improved if it was stressed that demand and supply are relationships and are unaffected by changes in the price of the product. Having an application box that differentiates between a movement along demand (or supply) and a shift of demand (or supply) would be valuable. As mentioned previously, the text should drop its treatment of competing products from Chapter 3 as it is really about oligopolistic behaviour and should develop formal and consistent terminology for the maximum value that buyers are willing to pay and the minimum value that sellers are willing to accept in Chapter 5. I agree. I did not come across any inconsistencies. I agree. I find that it is very easy to drop sections of the text from my course and maintain a smooth flow in content coverage. I agree. The only changes in organization that I recommend are to move Section 3.7 to the end of Chapter 4 so that the concept of elasticity can be better applied to situations of market intervention and Section 5.7 to Chapter 14 so that these detailed section could be more easily excluded if instructors choose to do so. I agree. I did not come across any grammatical or spelling errors. A greater diversity is needed in the names of people used in examples and questions. Most of the names are typical western names that do not reflect the diversity of names found in my classroom. Please use names such as Harjeet, Siqing, and Akmed. Yes, I recommend the book. However, the text should include multiple-choice questions and questions with a greater range of coverage and difficulty levels.